I have mentioned before that I am a bit obsessed with making things. I have had this kind of craft aspiration before, but this time the urges are actually translating into real stuff that I have made! 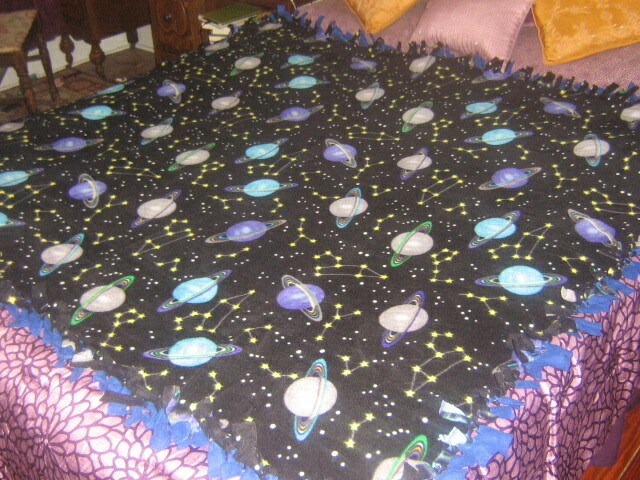 Oddly, this is not making my urges go away–every time I make something, the compulsion to make more things increases. For now, all of my friends and family are thrilled, but we will see how long it takes for them to turn me away like a gardener during zucchini season. 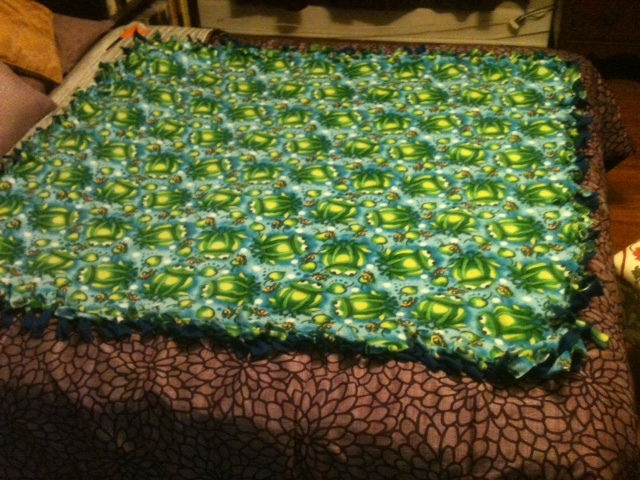 It took me a while to start these blankets, because I couldn’t find a ruler. I was sure I needed a ruler to get the corners cut out and all the fringe the same length. I finally realized the exact size didn’t matter, just (mostly) consistent cuts, so I made a template square from a sheet of paper and used it as a guide. That really did the trick. 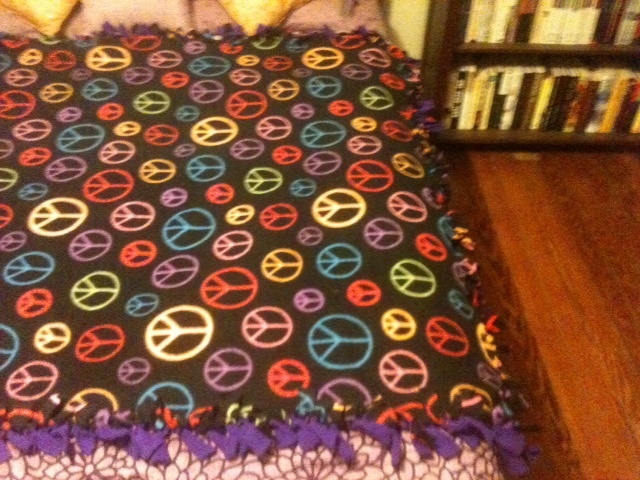 I just spread out the fleece on my bed, turned on NPR and did a lot of cutting and tying. I think they turned out very cute, and my kids really liked theirs (little brother will get his next weekend). My family mostly does presents for the kids only, but lately our celebrations have gotten smaller–everyone seems to be busy and geographically dispersed, not to mention all the other extended family obligations. Consequently, there aren’t as many children or adults, so we do sometimes exchange small presents among the aunts and cousins (the ones who still come around are women, mostly, that’s just how it worked out; my brother gets left out, but I don’t think he cares). Come to think of it, though, people have always brought the occasional crafty gift. It isn’t expected, but sometimes people just make something and distribute. My aunt makes earrings, but only when she finds beads that inspire her, for instance. This year, I made magnets. None of these are actually glowing; I need a new camera, but you get the idea. 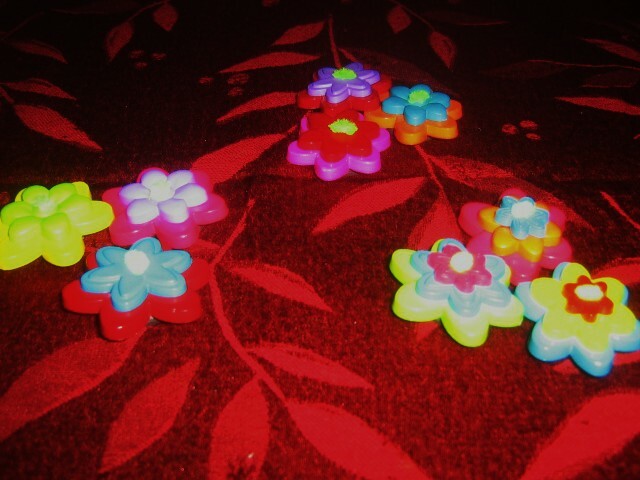 These were easy and fun to do, and my aunts and cousin loved them. I got the idea from my friend Hilary at the crafting party a few weeks ago–this is why I think getting together to craft with friends is so awesome. I also made a few with regular round buttons for another cousin, but I didn’t get a picture of those. I went out yesterday and bought a bunch of new craft supplies, including glass plates and spray paint to make my own custom plates. When I got home, though, it was raining outside, and I didn’t get any lace to make a pattern on the back of the plate, so I was bummed out. Then I remembered one of the things I wanted to do was to spray some of the plates with water and then silver paint, let that dry and back it with another color. I don’t have an empty spray bottle handy for the water, so a light rain was actually perfect for my purposes. 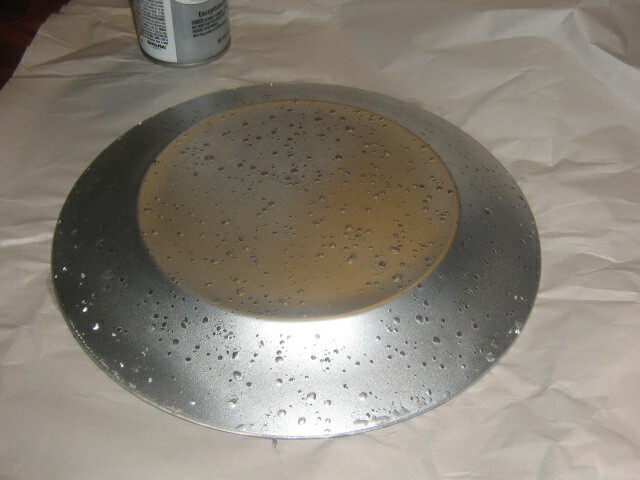 I ran outside and sprayed my first plate, and now I am waiting for good weather to finish with another color. I haven’t decided yet whether to back this one with Rich Plum or Jade, but if it turns out as awesome as I think it is going to be, it doesn’t really matter, since I will make many more! I always get something arty for my son, because he loves to draw and do crafty things. This year, I got him a drawing desk with a projector and light box. When he opened it, he said, “I was wondering when I would get a crafty present! Finally!” I am so glad he likes doing art! Later that morning, I was looking through my new craft book, and talking about gifts I could make to give out next year for Christmas. I learned this year that giving nice handmade Christmas gifts requires planning ahead, and it is fresh in my mind now, so I was going through all the things I could make, thinking about getting things done early. My daughter looked at my like I am crazy and said, “Mom, it is still *this* Christmas *today*! You have the longest possibly time to worry about this still! Why are you thinking about making next year’s presents already?” She is 14, though, so I am used to her thinking I am crazy, :). Okay, we have made it down to the final week before Christmas. I am so not ready, and not yet recovered from the big brake repair bill. But I get paid on Wednesday, and I have some time to spend at home finishing projects since I have no money left to spend until then! 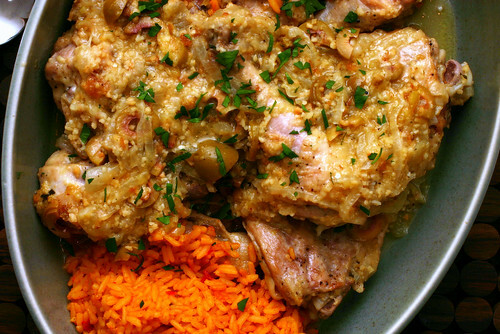 In the meantime, I am just about sick of trying to figure out what to make for dinner using ingredients that I already have in the house. Thank goodness that is almost over. 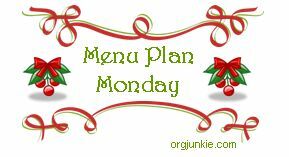 I am having my family over on Christmas Eve, because my children go to their father’s house at 10:00 AM Christmas morning, so I have a bit more planning than usual this week. 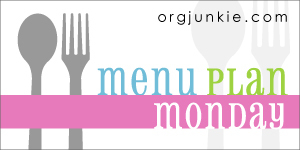 This post will be linked to orgjunkie.com’s Menu Planning Monday–head over there for lots of great ideas!